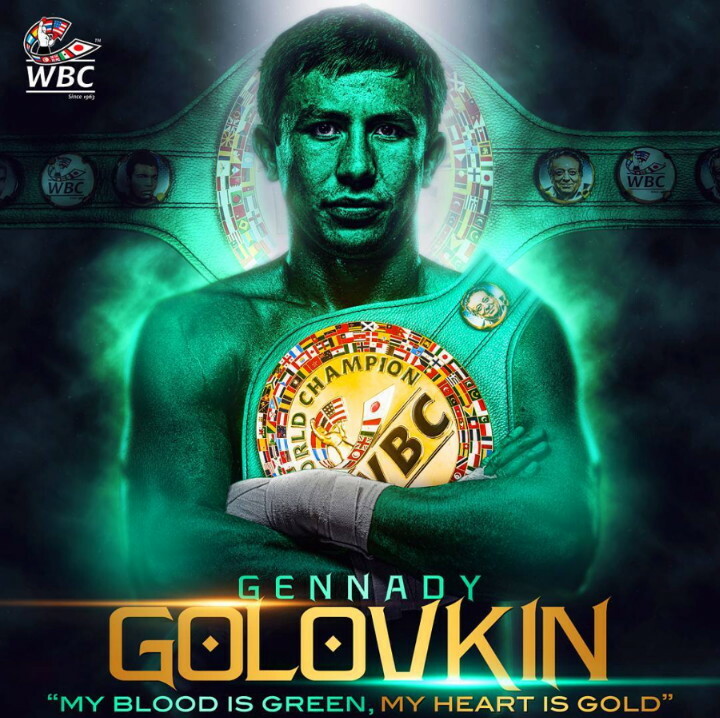 By Dan Ambrose: Middleweight champion Gennady “GGG” Golovkin (37-0, 33 KOs) surprisingly weighed in at 170 pounds for the World Boxing Council’s 30-day weigh-in on Wednesday for his September 16 title defense against Saul “Canelo” Alvarez (49-1-1, 34 KOs) on HBO pay-per-view at the T-Mobile Arena in Las Vegas, Nevada. Golovkin looked good, and he now has only 10 lbs. to lose to make the 160lb weigh-in limit on September 15. It’s unlikely that Golovkin will lose too much more weight if any, as he usually comes into his fights at around 170 to 173 lbs. It would be a risk for Triple G if he melted down lower than 170, due to the probability that Canelo will rehydrate to 175 lbs. on the night of their fight on September 16. Canelo is said to be at 175 right now. Golovkin doesn’t need to put himself at a weight disadvantage for this fight, because that would give away one of the advantages that he has in this fight in terms of his size. We’ll have to see how well Canelo fights at the weight, and how hard Golovkin can make him fight. Golovkin will need to push a fast pace to try and wear him down. When you have a fighter that is new to a weight class, the best thing you can do is make them fight hard at the new weight right from the start. If they’re not acclimated to the new weight, they’ll wear down. There has been a lot of Golovkin being really big during his training camp in Big Bear California. Golovkin started camp looking overweight and thick around the midsection. Photos of Golovkin standing next to IBF cruiserweight champion Murat Gassiev showed that he looked almost as big as him. Gassiev fights in the 200 lb. weight class. There was speculation that Golovkin started camp in the 190s, and that he would be around 185 lbs. for the WBC’s 30-day weight check. Canelo didn’t take part in the WBC’s weigh-in because he won’t be fighting for that title. Canelo has chosen not to fight Golovkin for the WBC belt. It’s thought that he still has bad blood over the WBC ordering him to fight Golovkin during his brief time as the WBC middleweight champion. Some boxing fans think Canelo doesn’t want to fight for the WBC title, considering that Jermall Charlo is now the mandatory challenger. Charlo would be a very tough opponent for the 5’8″ Canelo due his size, speed and power. By Canelo choosing not to fight for the WBC belt, he doesn’t have to worry about fighting Cahrlo if he somehow beats Golovkin. Golovkin always fights in the 170 lb. region for his fights after he rehydrates. This fight will be no different. Hopefully, GGG doesn’t overdo it in training camp and come into the fight worn down like he did for his last 2 fights against Danny Jacobs and Kell Brook. Golovkin looked like he’d left the best part of his game in training camp. Golovkin looked tired, drawn and with bags under both eyes on the night of his fight against Brook last year in September. Some boxing fans thought Golovkin was ill in the weeks before the fight. Golovkin didn’t say afterwards that he’d been ill. His trainer Abel Sanchez said that Golovkin was fine. He didn’t look fine. In Golovkin’s last fight against Jacobs, he had the appearance of a fighter that he overdone it in training camp. Golovkin sparred a lot with the hard hitting super middleweight contender David Benavidez. It’s possible that Golovkin was worn down from the camp. It’s going to be important for Golovkin not to wear himself down for the Canelo fight because the redheaded Mexican warrior will be looking to take advantage of his hand speed and work rate to try and get Golovkin to fade. Canelo will need to worry about gassing out against Golovkin at the new weight. Canelo needed a lot of rest breaks when he was fighting in the 155lb catch-weight that he’s been consistently fighting at for the last 3 years. Now that Canelo is free to fight at 5 lbs. higher than the weight he’s been fighting at, he could have problems. Canelo lost to Mayweather in 2013 in a fight that was clearly a loss for him. Canelo’s wins over Lara, Cotto and rout were very close and some would say more than a little controversial. Canelo didn’t show that he was much better than Lara, Cotto and Trout. Those fights could have been draws, and few boxing fan would have argued with that ruling. Of course, there are people that believe that Canelo has greatly impressed since those fights took place. If that is indeed the case, then Canelo will be a far more difficult opponent for Golovkin than originally believed. We can’t really know if Canelo has gotten better because he hasn’t beaten a good enough opponent lately to tell if he’s improved. Those are not good enough fighters to get a full picture of Canelo’s so-called improvements. Jacobs gave Golokvin by far the toughest test of those 3 fighters, and that was mainly because Golovkin didn’t try and push for an early knockout. Golovkin was content to box Jacobs in the first 6 rounds when he was at his strongest. That was not a good idea on Golovkin’s part to do that, because by the time he tried to go for a knockout in the last 6 rounds, he was tired and lacked the energy to get Jacobs out of there. Golovkin outsmarted himself by choosing to wait too long before he went for the knockout. That was Golovkin’s mistake in that fight. If he makes the same mistake against Canelo on September 16, he’ll pay for it by losing a decision. Golovkin is not likely going to win a decision against Canelo, because he doesn’t have the hand speed that he possesses. Golovkin won’t be able to hit Canelo enough for him to win a decision.